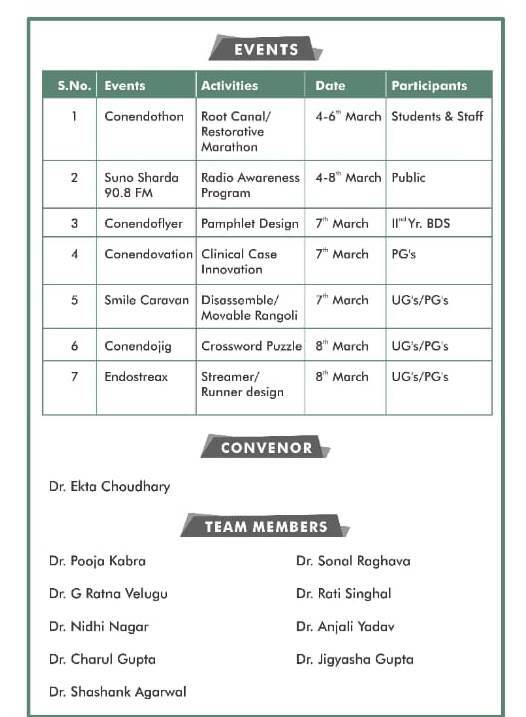 School of Pharmacy (SOP) Sharda University is organizing ‘Parent Teacher Meeting (PTM)’ on 2nd March, 2019. Parents of students are cordially invited to attend the PTM to discuss regarding attendance & performance of their wards with teachers and to discuss the overall performance of the students. To discuss the overall performance of the students. Time: 11:00 am to 2:00 pm. 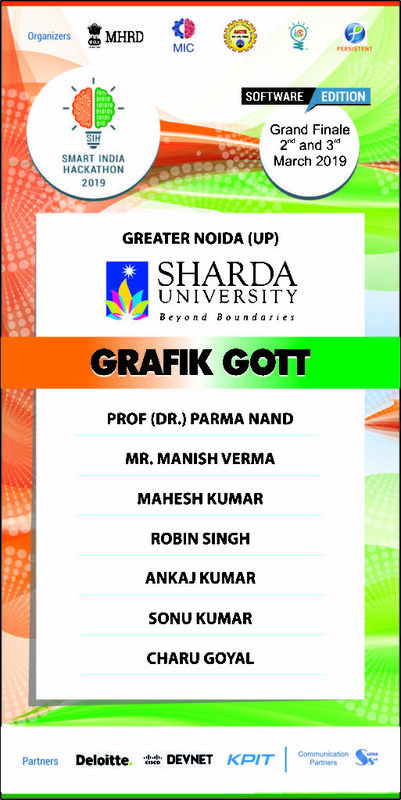 Venue: Room No -404, Fourth Floor, Block 4, Sharda University. SOP is organizing Presentation for Journal Club on 2nd March-2019. 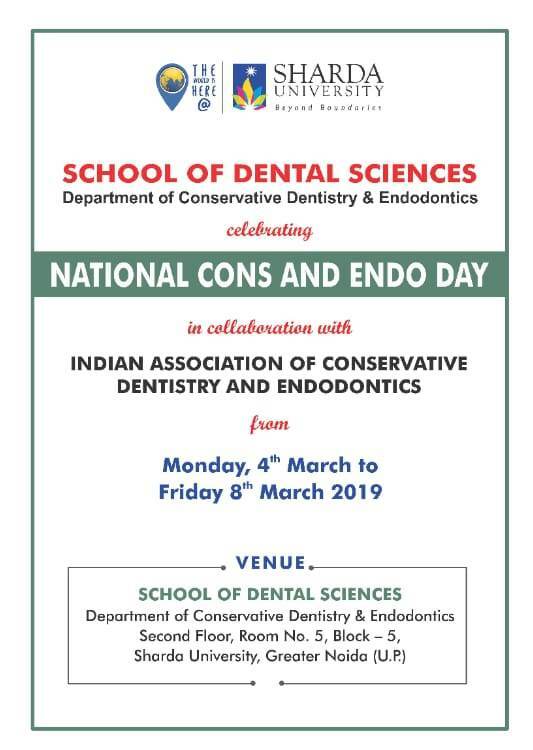 School of Dental Sciences (SDS), Department of Conservative Dentistry & Endodontics celebrating “NATIONAL CONS AND ENDO” DAY. 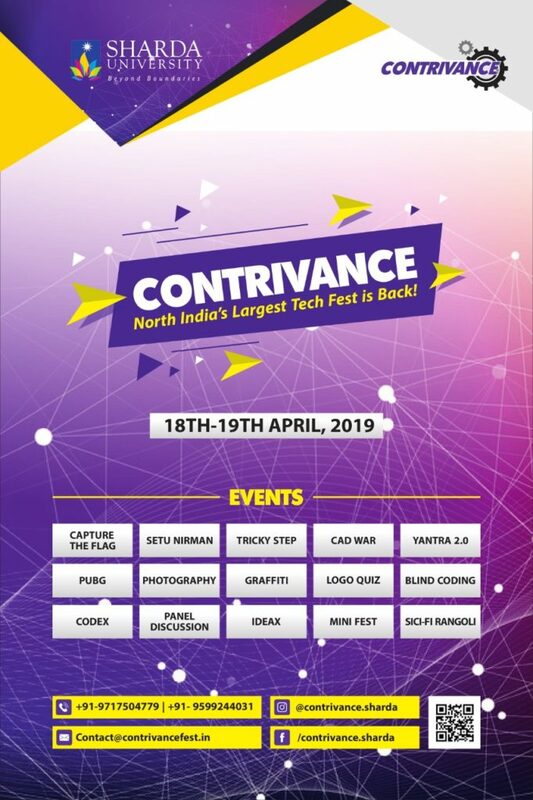 In collaboration with Indian Association of Conservative Dentistry & Endodontics form Monday 4th March to Friday 8th March 2019. It is a Cons Endo day celebration in which dental treatment will be done on reduced affordable rates. Also, it involves various activities in which students & staff will be participating. Date: Monday 4th March to Friday 8th March 2019. Finance department of School of Business Studies, Sharda University is organizing an Industrial Visit of students to Mother Dairy Plant, Patparganj, New Delhi. Mother Dairy Plant, located at Patparganj, New Delhi, is one of the largest liquid milk Plant in Asia. Mother Dairy sells milk and milk products (Milk, cultured products, Ice creams, Paneer and Ghee) at a national level through its sales and distribution networks for marketing food items. School of Law, Sharda University is organizing a workshop on “Intellectual Property Rights” : on Monday, 04th March 2019 from 11:00 am onwards. Tarun has over 14 years of experience in a broad range of Intellectual Property subject matters. Tarun has executed numerous assignments related to exercises of Patent Portfolio Creation, Protection, Valuation and Commercialization for corporates ranging from Small Start-ups to Fortune 5 companies. Tarun focuses on the Patent Preparation, Prosecution and Litigation Opinions for Computer-Implemented, Telecommunication, Electronics, and Mechanical subject matters. He has, apart from handling IP Matters over 3000 Indian and International Clients. He is also a member of APAA, AIPLA, NASSCOM, INTA, AIPPI, and LES. To give the students knowledge of Intellectual Property Rights Laws and its relevance. To give students an understanding of the practical aspect of Intellectual Property Rights Laws. To introduce the final year students about various placement opportunity in the field of IPR. Understand the importance of Intellectual Property Laws. Understand the practical aspect of Intellectual Property Laws. Ms. Anu Singh, Asst. Professor, SOL, anu.singh1@sharda.ac. Department of Computer Science and Engineering, SET is organizing Cisco Networking Industrial visits at Network Bulls for B.Tech Students on 5th, 6th, and 7th March 2019. Department of Design, School of Creative Art, Design and Media Studies (SADMS), Bachelor of Visual Arts is conducting a one-day Educational studio Visit to an international artist workspace on 5th March 2019. The aim of the trip is to provide the students with an insight into the studio work of a practicing artist. It focuses on introducing the significance of process in art practice and how every step is crucial in the art making. 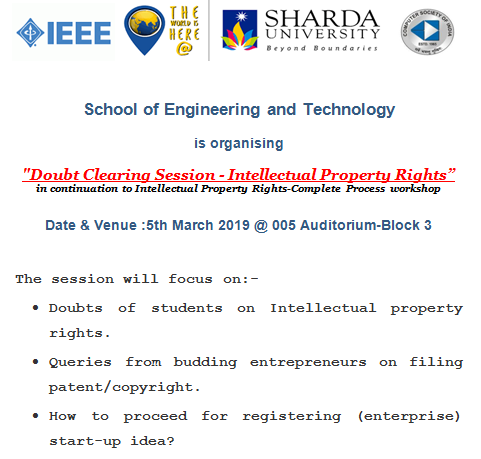 School of Engineering and Technology(SET) is organizing “Doubt Clearing Session – Intellectual Property Rights” in continuation to Intellectual Property Rights-Complete Process workshop. Doubts of students on Intellectual property rights. Queries from budding entrepreneurs on filing patent/copyright. How to proceed for registering (enterprise) start-up idea? Dr. Shweta Singh, Founder, and CEO ENNOBLE IP and Women Innovation & entrepreneurship foundation. She is a patent advisor, mentor, evangelist, startup advisor, investor and guide to many startups, universities and SMEs. 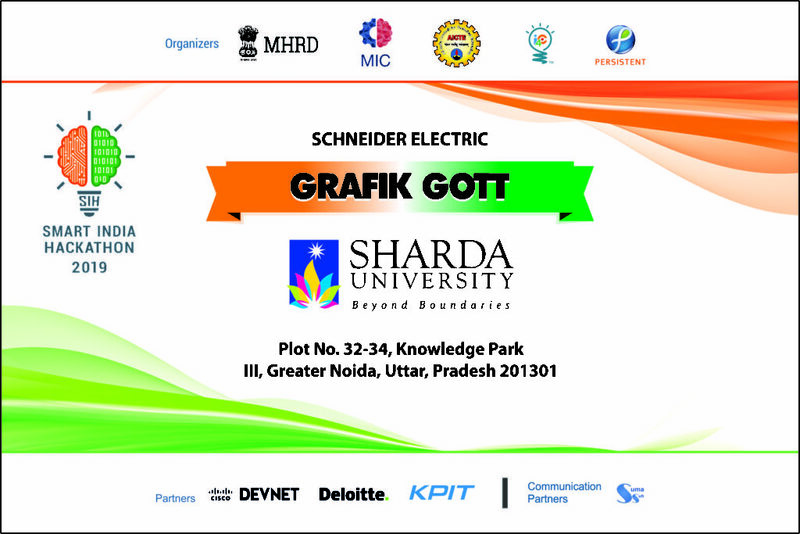 Department of Electrical & Electronics Engineering, School of Engineering & Technology (SET), is organizing a field visit to Electrical Substations of Sharda University for Students of second and third year EEE on 5th March 2019. To get practical knowledge of electrical power transmission and distribution. To make students aware of the Power system networks. To make them familiar with substation and transmission types of equipment like Transformer, circuit breaker, Transformer isolator, bus bar, Protective relays etc.